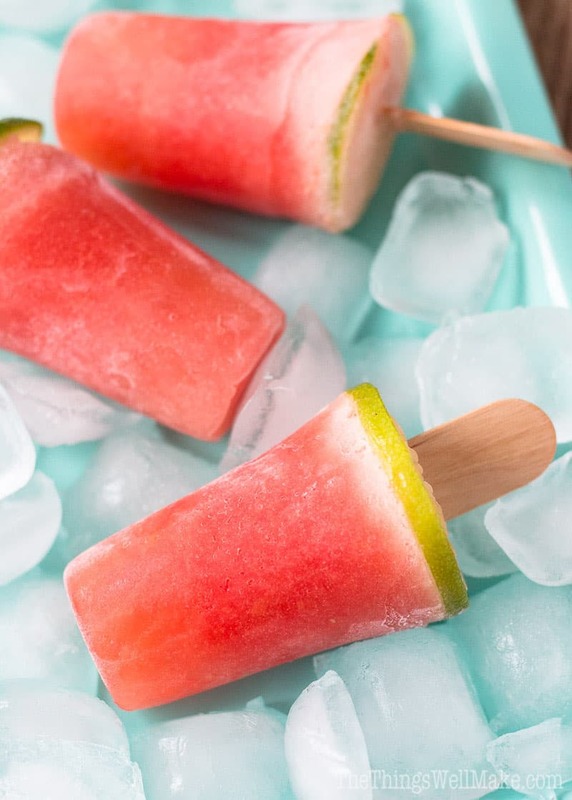 Watermelon Gelatin Popsicles ( & other Healthy Jello Pops) - Oh, The Things We'll Make! These watermelon gelatin popsicles (and other healthy jello pops) are fun to make and taste great. Not only do they give you a healthy dose of collagen and protein, but they have a great texture and don't drip the same way icy popsicles do! The other day, I showed you how to make a healthy gelatin dessert using fresh fruit and fruit juices. Today, I'm going to take things one step further and make them into fun gelatin popsicles. You might be wondering why you would want to make gelatin popsicles. Well, this may age me, but when I was a kid, the Jell-O brand made what was known as “Jell-O Gelatin Pops.” I think they came around in the mid 80's, and, to my dismay at the time, weren't around for very long. I used to love them in all of their artificial flavor and color, too-much-sugar glory. When they stopped selling them, I resorted to making my own version. At the time, I was convinced that fat and calories were our enemy, so I made my own “healthy” version with Lite Jello-O using artificial sweeteners, apart from the artificial colors and flavorings. Since then, as you know, I've changed the way that I eat quite a bit! That doesn't mean, though, that I can't have a fun, real food and healthy version of one of my favorite childhood treats! What's so great about gelatin popsicles? Gelatin changes the consistency of the popsicle in a way that I can't really describe. Some people describe them as “creamy,” but they aren't really creamy in the same way that ice cream is. On the other hand, they are smoother and softer than an icy popsicle made from juice or fruit puree alone. If you use a healthy gelatin like one that comes from grass fed, humanely raised animals, then you are also adding in a healthy dose of collagen and protein to the popsicles. Not only is the texture great, but I love making these for kids because they don't drip in the same way as other popsicles! Think about it. As they start to melt, rather than turn right into fruit juice that drips off the popsicle, they start turning into gelatin on a stick! I absolutely love these, and have made all sorts of them using different flavored fruits. My favorites, again, are watermelon gelatin popsicles made with watermelon puree, and pineapple jello pops made from pineapple juice. I used store bought juice, rather than pineapple puree, for these pineapple jello pops so I could keep the gelled gelatin texture. I think what I love about these is that when they have a high concentration of gelatin, they have an almost chewy sort of texture that reminds me of licorice, something that I have always loved, but don't allow myself to eat very often. They are softer and less icy than fruit pops made from fruit juice or puree alone. To get that texture, though, you need the gelatin to gel. That isn't usually a problem with store bought fruit juices, but can be a problem when using certain fruit purees. Some fruits, like fresh (or frozen) pineapple, have proteolytic enzymes that affect the collagen structure which is what makes gelatin gel. They are the same enzymes that make pineapple a great natural meat tenderizer! Store bought juices are usually pasteurized, and the pasteurization process breaks down those enzymes, allowing the collagen structure to form into a gelled gelatin. These watermelon gelatin popsicles (and other healthy jello pops) are fun to make and taste great. Not only do they give you a healthy dose of collagen and protein, but they have a great texture and don’t drip the same way icy popsicles do! Cut watermelon into pieces (without rinds or seeds) and puree in a blender until you've obtained around two cups of juice/puree. Soften the gelatin by adding it to a bowl with 1/4 cup of the watermelon juice/puree. Meanwhile, in a saucepan, heat around 3/4 cup of the watermelon puree over low to medium heat. As it starts to get warm, add in the softened gelatin and stir until it is well dissolved. Remove the saucepan from the heat, and stir in the remaining watermelon puree. Pour the watermelon-gelatin mixture into popsicle molds, and freeze for several hours. If your gelatin mixture is still pretty warm after adding in the remaining cold watermelon puree, you can let it cool off a bit before placing into the freezer. If you are using sticks in your particular molds, you can get the gelatin to gel in the fridge before placing your sticks just where you want them! The gelatin will hold them in the right place while freezing. Remove from the molds and serve. If you are having a hard time getting the gelatin popsicles out of the molds, you can run them under warm running water for a few seconds before pulling them out. If you want to decorate your watermelon popsicles like I did, you can optionally pour in a little bit of coconut milk on top of the watermelon gelatin before freezing. (If you do it after allowing the watermelon puree to gel first, you'll end up with layers rather than an ombre look like with mine.) I placed a lime slice on top of mine, and it was held in place by the shape of the cups I used for freezing my popsicles. While I think it turned out cute, I will have to admit that the rind of the lime added a bit of a bitter flavor to the coconut milk layer, so it may be a better idea to add the lime slice after the popsicle has frozen, or to use a slice of green melon or kiwi instead. To make healthy gelatin pops using other fruit juices or purees, refer to my post on how to make a healthy gelatin dessert, and then rather than pour the final mixture into serving dishes and placing in the fridge, pour it into popsicle molds instead and freeze instead! What if I don’t have gelatin powder???????? I have crystals but I don’t have any gelatin powder.